KABUL, Afghanistan (AP) — Afghanistan’s President Ashraf Ghani and Chief Executive Abdullah Abdullah on Sunday registered to run for president later this year, setting up a rematch after a bitterly disputed 2014 vote led to a power-sharing agreement brokered by the United States. They are the front-runners among at least 14 candidates who registered to run in the July 20 vote. The election comes as the United States is accelerating efforts to end the 17-year war by trying to relaunch peace talks with the Taliban, who control nearly half the country. “We will bring peace, but we won’t beg for it,” Ghani said in a brief speech after registering. He also vowed to combat poverty. Ghani and Abdullah fought a tight race in 2014 that went to a second vote. But before the results of the runoff could be announced, Abdullah alleged massive fraud and warned of widespread protests. John Kerry, then U.S. secretary of state, interceded and helped cobble together a unity government. He also convinced the election commission to hold off on announcing the results of the runoff, which Ghani seemed poised to win. 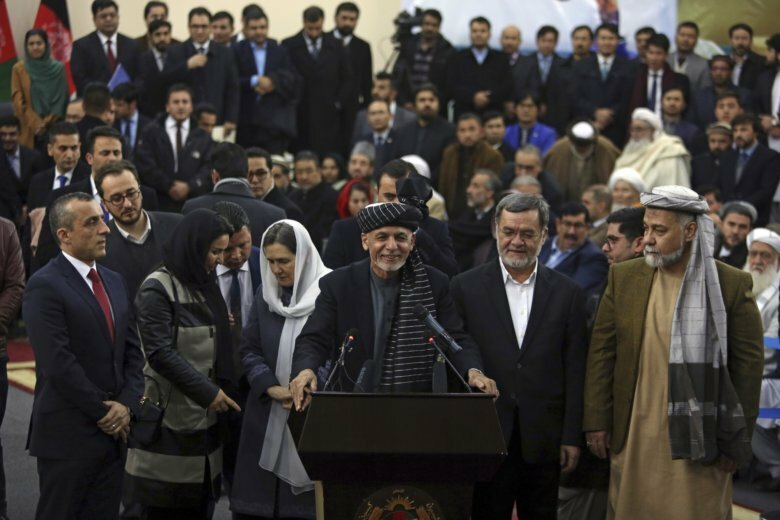 Ghani was named president and Abdullah was given the newly created title of chief executive. The arrangement was intended to last only two years but has continued up to the present, resulting in a government marked by deep divisions that has struggled to combat a resurgent Taliban. Abdullah has said that if he is elected president he will have a chief executive, while Ghani prefers to abolish the position. The election comes as Afghan security forces face near-daily attacks by the Taliban and an Islamic State affiliate. A Taliban suicide bomber targeted a convoy of provincial officials in the eastern Logar province on Sunday, killing eight security forces and wounding two others, according to Mohammad Naser Ghairat, a provincial council member. He said the attack targeted the province’s governor and intelligence chief, both of whom escaped unharmed. The Taliban claimed the attack in a statement sent to media.